The commonly held principles of good journalism are truthfulness, accuracy, objectivity, impartiality, fairness and public accountability. 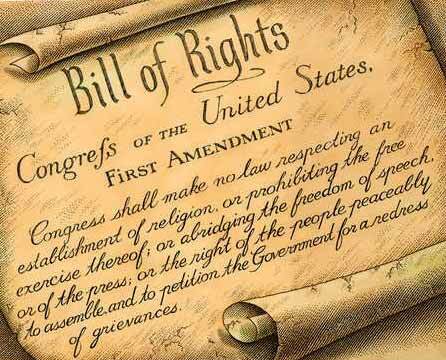 Freedom of speech and of the press is so important that is was written into the 1st Amendment of the U.S. Constitution. Or rather, We Have a Bad News Problem, Not a Fake News Problem. The current trend is that a majority of Americans relying on news from Internet, and in particular, social media. Social media news drives web traffic to growing numbers of websites devoted to publishing hoaxes, propaganda, and dis-information. 1. Real news is presented by real news sources. Check your news sources of a code of ethics or a mission statement. 2. Real news is written by reporters with degrees in journalism and often in fields in which they write. 3. The primary goal of real news is to inform. If you're mad, scared, furious, or anxious, you may want to further investigate the article's claims. 4. Real news can be verified. You should be able to find reports, statistics and other real news articles that support what you are reading. Mass Media is directed towards large audiences. It is public, the content is open to all audiences are made up of people living under different conditions in widely different cultures. It establishes contact with people at a distance from the media source and from each other. The audience for mass communications is unique to modern society. The Web is just another form of mass media. What is the main idea? How was this constructed? What picture of the world is being presented? What people and what subjects are represented and how? Are the portrayals of people or other subjects accurate, exaggerated, biased? What argument is being made? However realistic, natural, or factual a media project may seem to be, it is always a construction. Instead of reflecting reality it represents a specific aspect of it from a specific perspective. Whose point of view is it? What does the author want the viewer to think about the image? Each media product is intended for a particular audience and it is important to ask who the target audience is. Are there assumptions built in to the text or image that the media makes about its audience? How about the audience's assumptions? Each person will interpret the same text or image differently, bringing their own experience to it when critically analyzing its meaning. ASK: What values/ideologies underlie this? The media convey values through form and content. Sometimes the values are obvious, but more often they are hidden behind what may appear to be a neutral stance. The important thing to remember is that they are always there even if they are part of the shared assumptions of the mainstream culture in a way that makes them seem invisible. What facts or information are offered in support of the argument or idea being presented? How reliable is the information? What is the form of the presentation? How is the message conveyed via words, images, and sounds? ASK: Who owns this? Who benefits from it? Media products are made for profit. The creative and editorial decisions made by producers are based on what will sell. Consider who might be selling what to whom when evaluating a media text/image. Most of the ideas came from the Center for Media Literacy web site and The New Media Literacy Handbook by Cornelia Brunner and William Tally. 1. You deserve the truth. You are smart enough to make up your own mind - as long as you have the real facts in front of you. You have every right to be insulted when you read fake news, because you are in essence being treated like an idiot. 2. Fake news destroys your credibility. If your arguments are built on bad information, it will be much more difficult for people to believe you in the future. 3. Fake news can hurt you, and a lot of other people. Purveyors of fake and misleading medical advice like Mercola.com and NaturalNews.com help perpetuate myths like HIV and AIDS aren't related, or that vaccines cause autism. These sites are heavily visited and their lies are dangerous. 4. Real news can benefit you. If you want to buy stock in a company, you want to read accurate articles about that company so you can invest wisely. If you are planning on voting in an election, you want to read as much good information on a candidate so you can vote for the person who best represents your ideas and beliefs. Fake news will not help you make money or make the world a better place, but real news can. Journalism is a highly competitive field right now. Professional journalists have training and experience not only in things like interview techniques and fact-checking, but in ethics and things like libel law. While journalists are people and subject to biases like the rest of us, in their professional capacity journalists working for respected news sources strive for objectivity. Almost all news outlets (legitimate and fake) rely on advertising as a source of income. Professional journalists and editorial staff are paid to do quality work, including fact-checking, conducting meaningful and ethical interviews, and striving for objectivity. They work quickly, but it still takes time, effort, and money. When readers are drawn to "news" not to learn information but to confirm pre-existing beliefs or to feel the sensation of being outraged, fake news sites draw traffic from legitimate sites. This can take income from online advertising away from sources supporting serious journalism. It can also erode public confidence in journalism.